This indicator notifies and draws an arrow on the chart whenever the main stochastic line has crossed over its signal line in the overbought or oversold zone. It also notifies and draws a star on the chart whenever the RSI line has crossed in the overbought or oversold zone. · You could change setup colors, the default are blue for oversold and red for overbought. · You could change input parameters for STOCHASTIC and RSI as well as overbought and over sold level that suits your strategy. Do Alert: if set to true, then a desktop pop-up alert will appear from your MetaTrader terminal whenever an arrow forms. Do Push Notification: if set to true, then a push notification will appear on your MetaTrader mobile phone app. 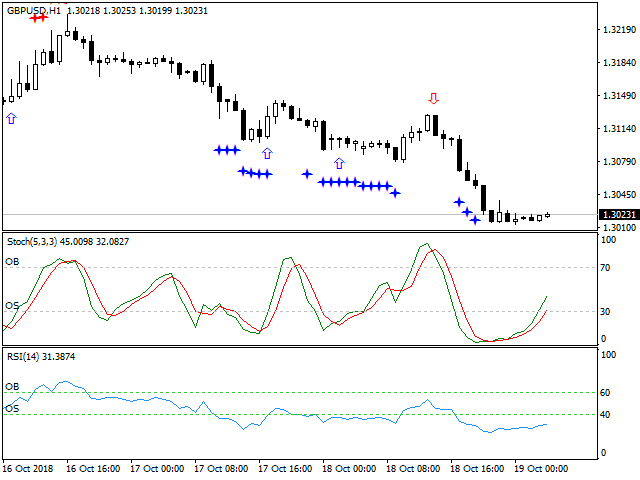 Do Stoch: if set to true, then stochastic is activated. 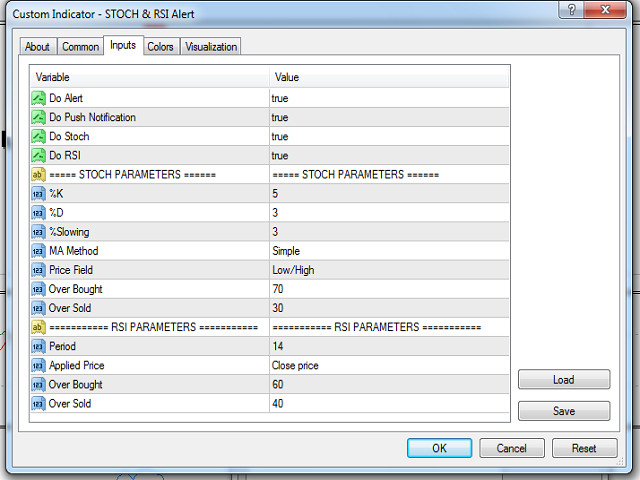 Do RSI: if set to true, then RSI is activated. %K Period: Period of the %K line. %D Period: Period of the %D line. MA Method: Moving Average method. Price Field: Price field parameter. It can be “Low/High “or “Close/Close”. Applied Price: Applied price option.